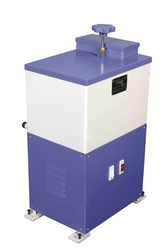 Leading Wholesale Trader of jominy end quench test apparatus and jominy test fixtures from Pune. Test Piece Diameter 25 ( +0.5 -0.0)mm. Distance From Tip Of Nozzle To The Bottom Of Test Piece 12.5 + 0.5 mm. This apparatus is useful for determining the harden ability of steels by end quench test. The test consists of heating a standard size specimen to a given temperature for a specific period of time, followed by a water quenching of one end under specified conditions and measuring the hardness at various points from quenched end along the length of test piece. After heating, the test specimen is kept on the specimen support, where it is automatically centered with respect to water jet. The quick action valve starts impinging the water jet on the specimen end instantly. 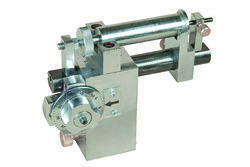 The elaborate arrangement of pump, tank, pipe etc, enables to obtain desired correct water head for the nozzle. The electrical controls and safety devices for pump and motor are provided and the entire apparatus is totally enclosed. The most commonly used method for determining harden ability is the end quench test developed by Jominy Boegehold. In this test a normalized 25 mm diameter 100 mm length test sample of steel to be evaluated is heated uniformly to its austenitizing temperature. The specimen is then removed from the furnace placed in the end quench test apparatus immediately end quenched by a jet of room temperature water. After end quenching, longitudinal flat surfaces are ground on opposite sides of the test piece as per dimensions. This grinding is very important for correct positioning of the sample in the fixture and also for accurate repeatable and reliable test results. Jominy Test Fixture is to be positioned on the main screw of the hardness tester for checking hardness of the test sample. Hardness at equal intervals (1 mm or 1/16') to be checked and noted. Plot the resulting data on graph paper with hardness value as ordinate (Y axis) and distance from the quenched end as abscissa (X axis). By comparing the curves resulting from end quench tests of different grades of steels, their relative harden ability can be established. Thus the flatter the curve, the greater the harden ability. The details of the test are covered in IS : 3848-1981 ASTM : A 255. Looking for Jominy Hardenability Test Setup ?